a spacecraft on hand to measure particles and fields. During the time it takes you to read this article, something will happen high overhead that until recently many scientists didn't believe in. A magnetic portal will open, linking Earth to the sun 93 million miles away. "It's called a flux transfer event or 'FTE'," says space physicist David Sibeck of the Goddard Space Flight Center. "Ten years ago I was pretty sure they didn't exist, but now the evidence is incontrovertible." Indeed, today David Sibeck is telling an international assembly of space physicists at the 2008 Plasma Workshop in Huntsville, Alabama, that FTEs are not just common, but possibly twice as common as anyone had ever imagined. Researchers have long known that the Earth and sun must be connected. Earth's magnetosphere (the magnetic bubble that surrounds our planet) is filled with particles from the sun that arrive via the solar wind and penetrate the planet's magnetic defenses. They enter by following magnetic field lines that can be traced from terra firma all the way back to the sun's atmosphere. 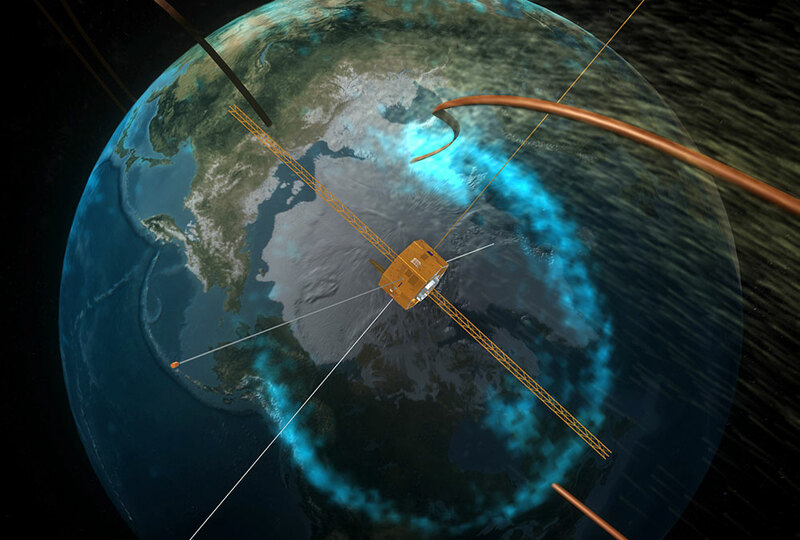 "We used to think the connection was permanent and that solar wind could trickle into the near-Earth environment anytime the wind was active," says Sibeck. "We were wrong. The connections are not steady at all. They are often brief, bursty and very dynamic." On the dayside of Earth (the side closest to the sun), Earth's magnetic field presses against the sun's magnetic field. Approximately every eight minutes, the two fields briefly merge or "reconnect," forming a portal through which particles can flow. The portal takes the form of a magnetic cylinder about as wide as Earth. The European Space Agency's fleet of four Cluster spacecraft and NASA's five THEMIS probes have flown through and surrounded these cylinders, measuring their dimensions and sensing the particles that shoot through. Now that Cluster and THEMIS have directly sampled FTEs, theorists can use those measurements to simulate FTEs in their computers and predict how they might behave. Sibeck believes this is happening twice as often as previously thought. "I think there are two varieties of FTEs: active and passive." Sibeck has calculated the properties of passive FTEs and he is encouraging his colleagues to hunt for signs of them in data from THEMIS and Cluster. "Passive FTEs may not be very important, but until we know more about them we can't be sure." Why do the portals form every 8 minutes? How do magnetic fields inside the cylinder twist and coil? "We're doing some heavy thinking about this at the Workshop," says Sibeck.